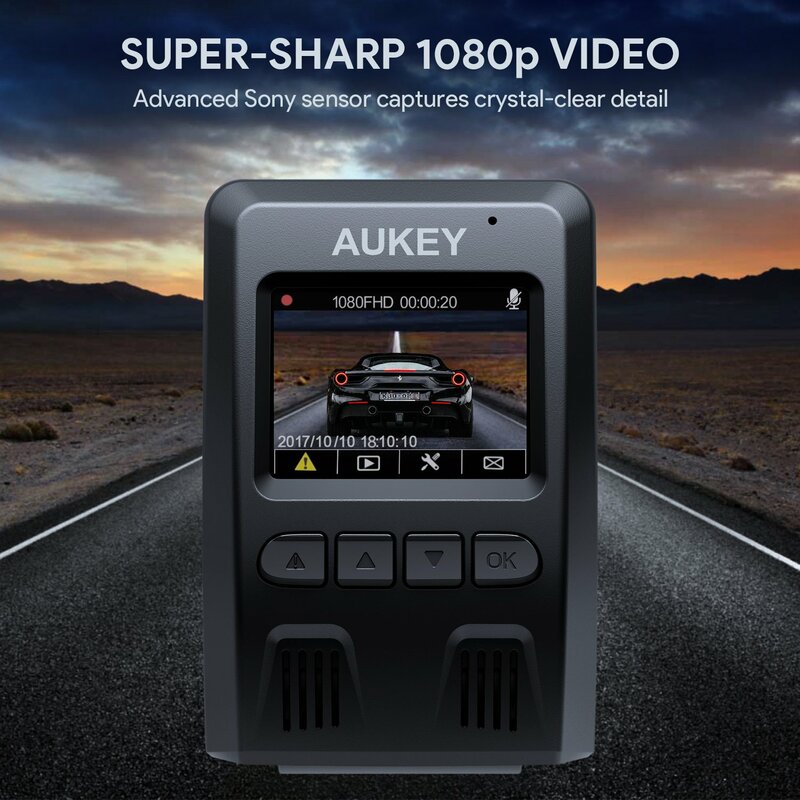 Aukey is quite a big name in dash cam technology and we have previously put some of their dash cams through their paces, so we jumped at the chance to test out their dual dash cam so that we could give you our review. There were a few things that we didn’t really like, but overall we were quite pleased with this device. Read on below for our thoughts. Very impressive 170 degree wide angle lens which captures up to 6 lanes. Very good quality of recording thanks to the 1080P full HD resolution. Adhesive pads provided are not strong enough for the camera. The rear camera cable is a little difficult to hide. When we first saw the design of the Aukey dual dash cam, we were a little unsure about it. We initially felt that it was a little too bulky and we were worried that it would obstruct our view, but thankfully this wasn’t the case. At the front of the device you will find the lens which is positioned perfectly. When we looked at the device in the box, we were a little worried that it would feel cheap. However, this really wasn’t the case. The camera has a nice weight to it and the materials do actually feel of a really high quality. Overall, we were pleasantly surprised with the quality of it. 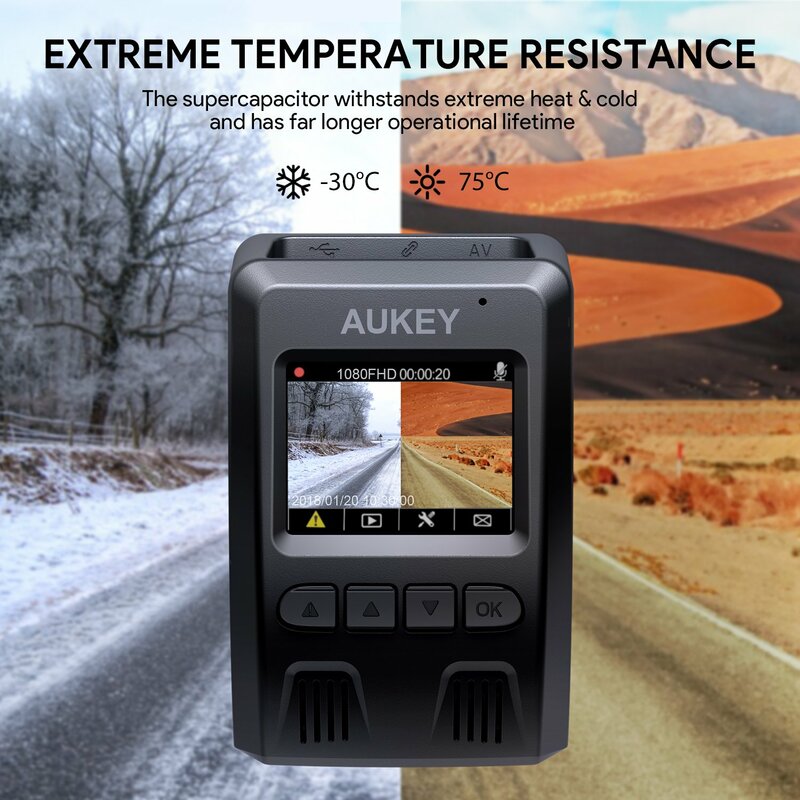 When it came to installing the Aukey dual dash cam, there were a couple of things that we felt could perhaps be improved upon. The initial set up of the device is easy enough, but when it came to installing the cameras in the car, we did have a few issues. First of all, we felt that the cable to the rear camera was a little difficult to hide which was frustrating. Another issue that we had was that the adhesive pads that are supplied with this camera don’t seem to be strong enough to support the device. We found that by purchasing a suction mount separately we were able to get it positioned properly and didn’t have any problems after that. Aside from these two issues, we found that using the device was really easy and it performed very well. The lens angle of this dash cam is very impressive indeed. It is a 170 degree wide angle lens which actually covers 6 lanes; something that we definitely were not expecting. We were also really surprised with the quality of the footage that we recorded. When we played back our footage via the device, we were a little disappointed because it seemed that the quality was quite low and we couldn’t see number plates clearly. However, when we plugged the device into a PC for playback, we were able to see everything with complete clarity. It also performs very well in lower light conditions. Overall, we were very happy with the recording quality. This dash cam doesn’t really offer much in the way of extra features. However, the one feature that did stand out for us was the loop recording feature. This means that the camera automatically replaces files so that you never have to worry about running out of storage space on your device and missing important footage. We were really pleased with this. Overall, we have to say that we were impressed with the Aukey Dual Dash cam. 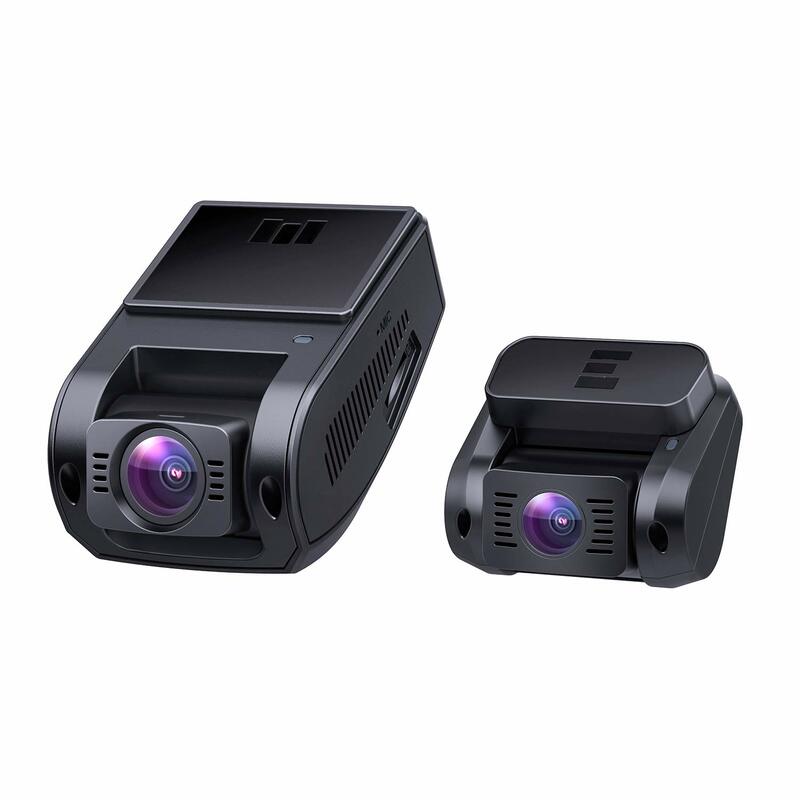 We had relatively minor issues with some aspects, but for the most part we were really pleased with it and would certainly recommend it to anyone looking for a basic dash cam that performs very well.